During my college years, I bartended, waitressed, and cooked (often simultaneously) at a local bar and grill. The menu included standard bar fare; burgers, grilled chicken sandwiches, french fries, chicken wings… You get the idea. 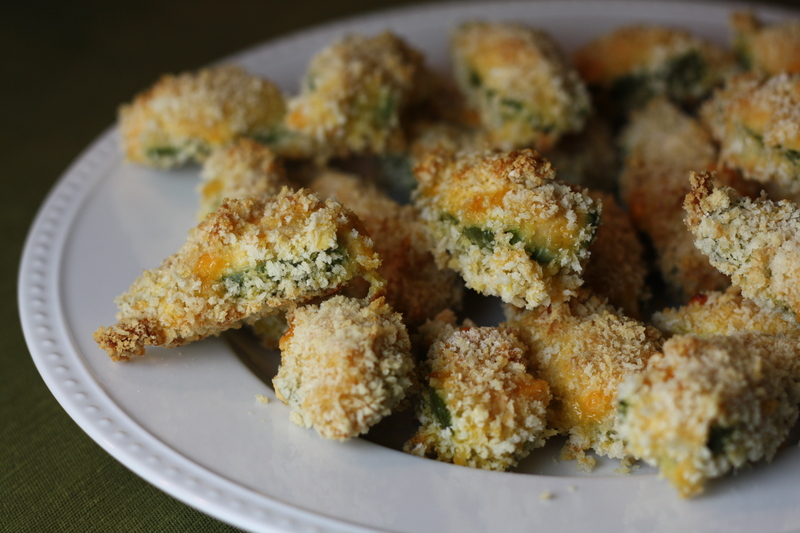 Among the appetizer choices were Jalapeño Poppers; like the kind you can find in the frozen food section of your grocery store. We served the cream cheese variety; my personal favorite. During my time there, I became a little addicted to those spicy little poppers. An order for six would come in, but I’d throw seven in the fryer. Quality control is important, you know. Between those cheesy jalapeño poppers and french fries dipped in wing sauce, I’m lucky I didn’t have to roll myself down the aisle at graduation. Until last year, those spicy frozen snacks were my only experience with jalapeño poppers. I tried the cheddar cheese variety, but always returned to my favorite cream cheese poppers. And then, during last year’s winter escape to sunny Florida, I landed upon crab-stuffed jalapeño poppers on the menu at a beachside restaurant near our temporary home. These were not the frozen and fried variety I was familiar with. 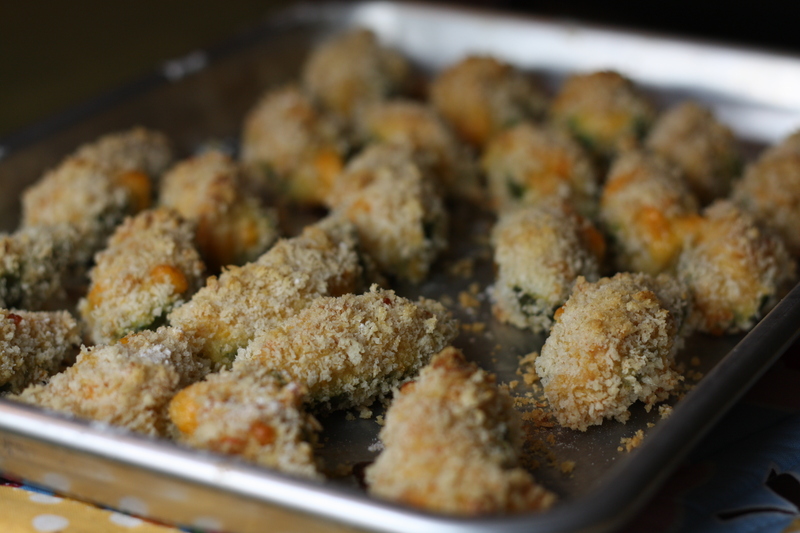 These were fresh jalapeño peppers, stuffed with crab meat, cream cheese, and seasonings; then breaded and baked. The difference in freshness and flavor was astounding. 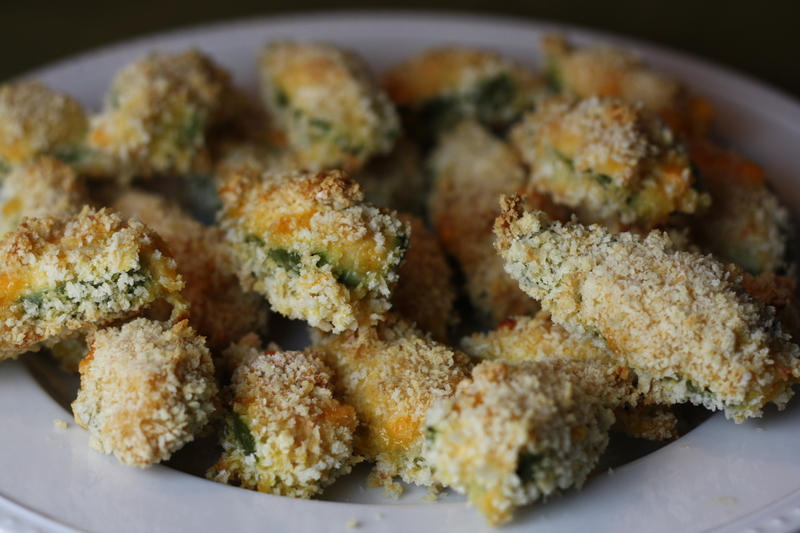 I’ve been meaning to create my own version of those delicious, crab-stuffed jalapeño poppers ever since that Florida trip. This past weekend, I finally had the perfect opportunity. The result was a fresh, spicy, and satisfying addition to our hors d’oeuvres selection. Definitely keep these spicy little poppers in mind when you’re planning your holiday festivities. They take a little time to prepare, but the resulting fresh, spicy flavor is well worth it. They’re also a proven clear-your-sinuses remedy for the common cold. Here’s a little tip… One of the reasons I’ve held off on making these crab-stuffed poppers is that my grocery store only carries lump crab meat in 1 pound containers, for a hefty fee. Occasionally they’ll offer an 8-ounce container, but for no great bargain. The popper recipe does not require a large quantity of crab, which potentially leaves you with a considerable quantity of pricey leftover crab meat. One option would be to whip up some Jumbo Lump Crab Cakes, which make another great appetizer in miniature form. An even easier alternative, as I discovered this weekend, is to simply double the filling in this recipe and turn the leftovers into a really spectacular warm crab dip. Simply spread your leftover filling into a baking dish and bake until bubbly. Serve with chunks of baguette or crackers. Preheat oven to 350 degrees. 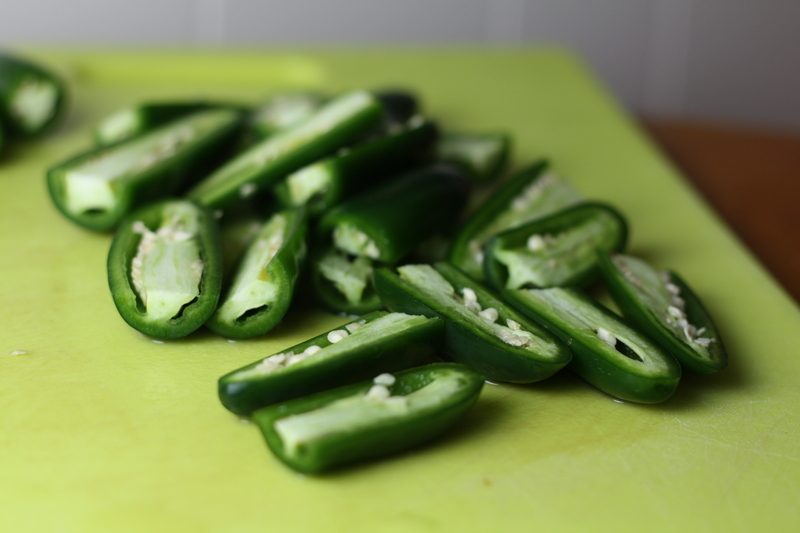 Rinse jalapeño peppers, cut off the stem, and cut in half lengthwise. Use the edge of a teaspoon to remove the ribs and seeds from the peppers. In a bowl, combine the cream cheese, cheddar, crab, and seasoning until well blended. Fill each pepper half with a small mound of the mixture. Bake for about 35-40 minutes until the outside is golden brown and the filling appears bubbly. *If desired, you can prepare the poppers to this point ahead of time, refrigerate, and bake later in the day. To keep the crab fresh, don’t prepare the poppers more than a few hours ahead of time. Posted in Appetizers, Cheese, Food, Recipes, Seafood, Side Dishes, Vegetable and tagged appetizers, Cooking, crab, Food, food photography, hors d'oeuvres, peppers, Recipes, seafood. Bookmark the permalink. This is right up my alley! I will be shooting a New Year’s Eve show featuring all appetizers…I may make a variation of this in that episode. A couple of things that I love about this: 1. You mention the cost of the crabmeat as a potential issue – better that the interested party know up front rather than get to the market and scratch the idea…very smart. Also, 2. you offer suggestions on what to do with remaining crabmeat at the party – both of them outstanding ideas, by the way. I can appreciate baking them as the healthier alternative, but this is one of those items at a tailgate party or as I count down watching the ball drop, I may run this through a standard breading technique, maybe twice, and pan fry them stove top. I hope that I don’t offend with that – it’s merely a preference. 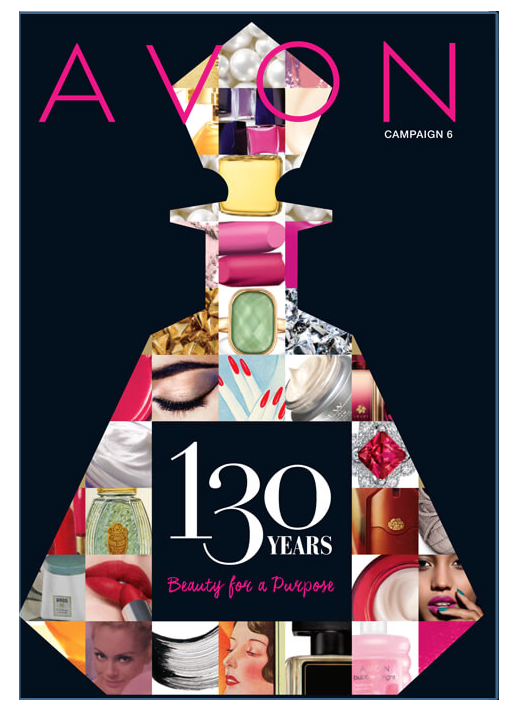 I think that it’s important to let you know that I am becoming a regular to your page, though! What a great recipe idea! Thanks for all of your feedback! It’s appreciated. I bet they’d be delicious double-breaded and fried! Let me know how they come out! Crab meat is my absolute favourite. 😀 Thankfully I can buy crab meat in small quantities here so these poppers are definitely on the list for this festive season. Thanks for sharing such a super recipe. I’ve never experienced poppers other than the standard bar versions of cheddar and cream cheese. Personally I like the cheddar better. The crab stuffed one though look like they’d blow the other ones out of the water! They look so delicious! Oh my good lord, heaven above…those look absolutely amazing!! I could not think of more perfect ingredients for this recipe! YUM! I wouldn’t have found this recipe in any better time. I have one whole dungeness crab sitting in my fridge begging to be used. And my hubby being jalapeno lover this will be perfect surprise for him. Did anyone have a problem applying the breading? The breading is definitely a bit tricky with these, since it has a tough time adhering to the smooth exterior of the pepper. The first dip in flour should help, but they definitely need to be handled with care to avoid accidentally knocking all of the breading off.